In short if we keep on with food production as we do right now, then we are in danger of having to deal with some very serious dilemmas. The authors reach back to several key points in history and very effectively demonstrate how mistakes were made that resulted in massive famines and subsequent turmoil. The frightening point is that these mistakes were repeated and our contemporary society is heading down the same paths. Key mistakes were: That we take the planet for granted the earth and expect that the land could be continually exploited and it would always return the food required; that specialists areas can be established to produce particular food rather than having diversity of areas producing the range of produce; that the weather is constantly on our side to produce all the food required; and that we can carry on being dependent on oil – that which underpins all manner of mechanisms for food production. Add to all these, that the governments still treat climate change as not being too significant. As any of these presumptions fail, the others failures start to kick and the resultant accumulation of failures will most likely bring about the forecasted disasters for our populations. The warnings provided by the authors are certainly timely. Today, the world’s food economy provides us with enough food to feed every person on the planet adequately, but fails to do so effectively, paradoxically leaving us with around 1 billion undernourished people and 1.6 billion obese people. Furthermore, the current population of around 6.5 billion is predicted to peak at 9 billion by 2050, demanding an increase in food production by an estimated 70 per cent. Will the current systems of food supply be able to meet the challenges of peak oil, the dislocations of human-induced climate change and the depreciation of the natural resource base of our ecosystems? The cycle of ecological decline is depicted as an inevitable outcome of food empires, but what do the authors see as the way forward? More food stocks must be held in reserve, and we must think in terms of “nested bioregionalism” within the global trading environment. International trade has been a constant in the history of humans and food since agriculture began, but more widespread biodiversity and variation in production at local and regional levels must predominate over current food-production specialisation and monoculture production. Consumption will see the end of cheap food, necessitating a cultural shift; at the same time, food production will become a more valued employment, lessening the exploitation of slave and cheap labour. But how can such steps be achieved? The political and governance means to achieve such ends at national, regional and global levels are not detailed here. But in the wake of recent commodity price rises and given the future challenges identified, governance responses and their coordination must be a priority for policymakers everywhere. The only weakness to this book is the final chapter. It does not really make any real conclusions beyond the obvious. 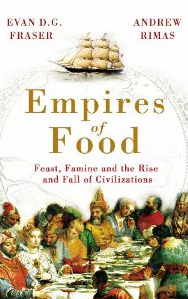 We need to pay attention to how we have set up Food Empires that are based on the practices of past generations which for them proved to be a total disaster. I suggest the modern supermarket is the biggest danger to our food production. More on supermarkets to come. Meanwhile I highly recommend this book.